GREAT FOOD, EXCITING ATMOSPHERE AND FABULOUS SERVICE. Whether you're planning the celebration of a lifetime or handling a business meeting for the boss, Tyler’s Party Room will help you throw the best event ever! Let Tyler’s take some of the stress out of party planning. Our staff will serve you in style and our beautiful party rooms will make your event an affair that will be remembered. Tyler’s new party rooms offers unique amenities and a flexible, lifestyle setting that will make your party a stand out event. From formal to casual, dining to lounging in style, we've got you covered. 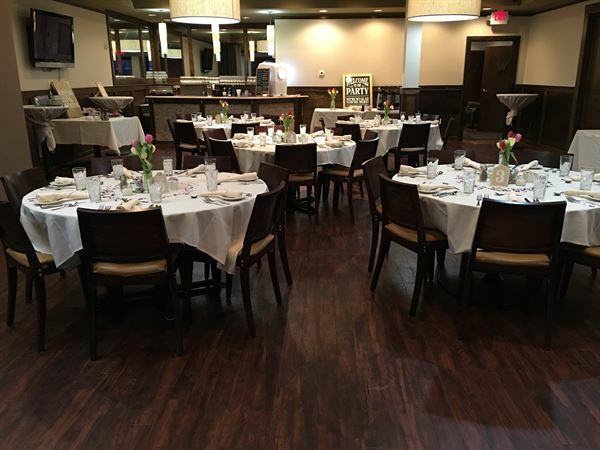 Whether you're planning the celebration of a lifetime or handling a business meeting for the boss, Tyler's Banquet Room will help you throw the best event ever! Let Tyler's handle the stress of event planning. Our staff will serve you in style in our beautiful banquet room and make your event an affair to remember. We offer unique amenities and flexible pricing. From formal events to casual dining, we have you covered. With our great selections of buffets or sit down dinners we can accommodate any party or corporate event. You may be certain that we will spare no effort to please you and make your function outstanding and successful in every way. AMENITIES AVAILABLE Complete Dining Service for breakfast, Lunch and dinner Reception and Party Area Meeting Setups Private Bar Area Secure Free Parking Two Large (50") Flat Screen Tv's Internet Integrated Private Restrooms Handicap Accessible Several Bar Options Contact our Banquet Coordinator directly at *NOT DISPLAYED* to inquire about how to book your next event with us! Beautiful Banquet Room to accommodate all your venue needs. Our room provides a private entrance, private bathroom facilities and is handicap accessible. I recommend this venue because the staff was excellent, the food was delicious and the price was right. It has a very nice atmosphere and they set it up very nice for you.